Find out why luxury vinyl tiles (LVT) make good and durable walls. One of the questions you ask yourself pre-renovation is how to jazz up your existing walls in some of your rooms. What materials will you use? Will you use hardwood or stone? Or will you go for tiles? Apparently, a number of homeowners have been choosing tiles for their walls—and not just in the bathrooms or kitchens. Homeowners and contractors take a great deal more into consideration when choosing tiles for the floor than for a wall, due to wear and safety issues, but "for walls, just about anything will do, making the art of wall decoration all that more spectacular with unlimited possibilities for expression," says Kathleen S. Stoehr, author of The Complete Home Decorating Idea Book. Tiles are versatile, too. "Tile is not just available in squares and slabs of varying sizes, but also in a variety of trim shapes and sizes that will accommodate just about any horizontal or vertical area." Given its colourful and tactile quality plus "the ability to actually form shapes and stories, tile is an exciting and exacting medium," declares Stoehr. There are different kinds of tiles in the market: ceramic tiles, porcelain tiles, quarry tiles. In recent years, another kind of tile material is fast gaining popularity among designers and contractors because of its multifarious benefits: vinyl wall tiles. Luxury vinyl tiles (LVTs) have been used for flooring, but not so much for wall coverings, until evoWalls from Evorich came along. "evoWalls Luxury Wall Tile is the first product to take the many innovations that have made vinyl such a popular choice for flooring and reapply them as a unique alternative to wallpaper, paint, paneling, ceramic or any other traditional wall covering," says Raymond Foo, Evorich's Head of Franchise & Business Communication. "Years of manufacturing and design advances have made vinyl a go-to choice for a wide array of settings. Both residential and commercial consumers have enjoyed the durability and design flexibility of vinyl. But never for luxury designer wall coverings." 1. evoWALLS come in beautiful textures, colours, and patterns. Versatile, evoWALLS can be used in entire rooms, feature walls, kitchen islands, backsplashes, columns, bar counters, and more. Plus, they can be installed in a variety of patterns: brick, diagonal, herringbone, in-line. Foo adds: "It adds great warmth, royal character, and beauty, and can be used to create astonishing effects in the room. It changes the entire look and feel of a room." 2. evoWALLS are durable. While ceramic tiles are more prone to cracks and other damages, and can easily break if scratched by hard objects, evoWALLS are equipped with Ceramic Bead Technology in the coatings for wear resistance and durability. 3. They can be easily installed and removed. evoWALLS can be applied directly over plywood, drywall, ceramic tile, wood paneling, concrete, plastics, cement board...practically any wall surface. 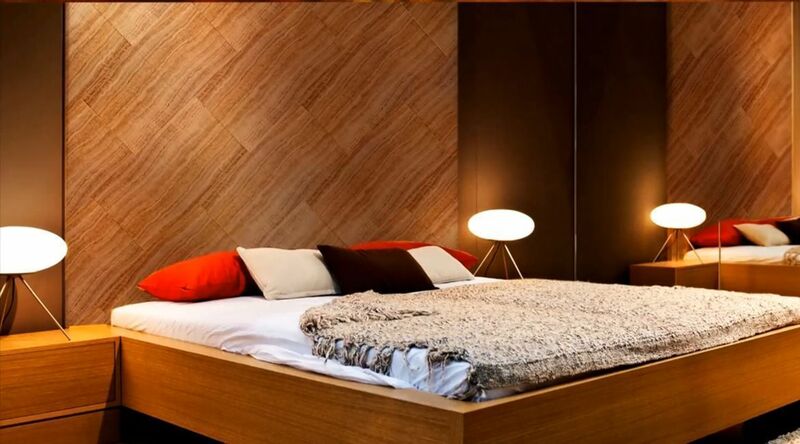 "Lightweight tiles apply easily with adhesive directly to almost any wall surface," says Foo. 4. Hack- and hassle-free. Thanks to evoWALLS, there is no need to hack your existing wall just to modify the look of your room. Also, there's no special maintenance required—evoWALLS are easy to clean, unlike ceramic tiles whose grout lines require major cleaning. 5. Enviroment-friendly. Made from pure vinyl virgin pulp, evoWALLS are guaranteed safe, and they use eco-friendly adhesives, too. In the same manner that Evorich's High End Resilient Flooring (HERF) has impressed many Singaporean homeowners because of its 100% waterproof and 100% termite-proof qualities, evoWALLS will also change the way you choose your wall covering. Knowing its many advantages, you now know why covering your walls in luxury vinyl tiles from evoWALLS is the wisest and most cost-efficient thing to do. Share with us your evoWALLS experience. Email us at hello@cromly.com.